Oaklawn’s path to the Kentucky Derby officially kicked off last month with the Smarty Jones, but things get more serious on Monday as 13 3-year-olds meet in Arkansas for a fantastic edition of the $500,000, Grade 3 Southwest Stakes. The two most respected Kentucky Derby contenders coming into this race, Uncontested and Lookin at Lee, are drawn alongside each other in the starting gate. There is a fair amount of speed signed on for this race in addition to Uncontested. The TimeformUS Pace Projector predicts that the Smarty Jones winner will be clearly in front early, but that the pace will be fast. Speed types such as Cool Arrow, Petrov, and One Liner should all be applying pressure through the early stages of this race. #1, COOL ARROW (12-1): It’s hard to fault a runner who’s been out of the exacta only once in six career starts and comes into this race having won three of his last four. That said, this colt will face a much more difficult task today. 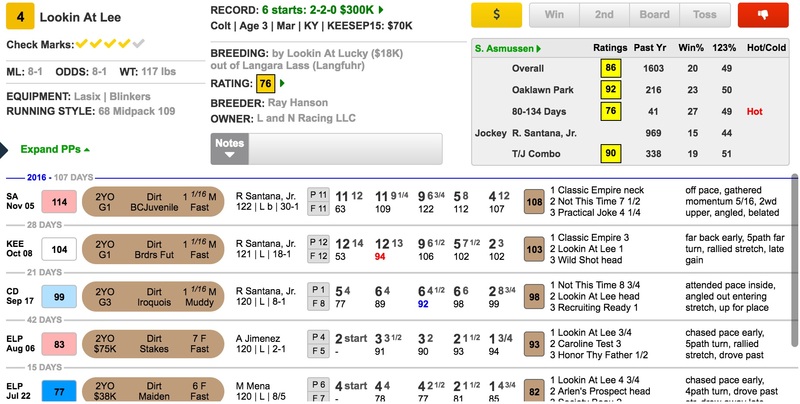 His dominant win in the Springboard Mile was largely attributable to the crawling early pace (indicated by the blue color-coded fractions in TimeformUS PPs) that he was allowed to set. He had previously lost to Warrior’s Club at Churchill Downs and that one was no match for Uncontested in the Smarty Jones. Given the likelihood of a fast pace in this spot, I prefer others. #2, SILVER DUST (10-1): Of those coming into this race off maiden wins, I find this runner to be most intriguing. He ran like a horse that had no idea what was going on in his debut as he broke slowly and then was drifting in while on his wrong lead for half of the stretch drive. Once he finally did switch leads, he leveled off nicely and finished well. He clearly benefited from that experience in his next start, in which he was much more professional. That day he rated kindly in behind horses and displayed an effective turn of foot once switched out in the stretch. Silver Dust hasn’t been seen for three months now, but his trainer, Randy Morse, has spectacular numbers with runners coming off layoffs of this type. It’s easy to see in TimeformUS PPs that he gets a 100 Trainer Rating with this move. When digging deeper using DRF Formulator, it’s revealed that he is 19 for 83 (23 percent) with horses coming off layoffs of 75 to 150 days, yielding a healthy ROI of $3.19. This horse has the pedigree to keep improving with age and distance, and I believe he’s one of the live longshots in this field. #3, UNCONTESTED (5-2): The Smarty Jones winner is obviously the horse to beat in this race. He earned a 96 Beyer Speed Figure for his win in the Smarty Jones, which is some eight points faster than the next-best speed figure in the field. He also enjoys an advantage when looking at TimeformUS figures. The Pace Projector is predicting a fast pace, but this horse has proven his ability to lay down some taxing early fractions and keep on going. I believe that he’s the most likely winner of this race, but he’s not going to offer any value at a relatively short price – and I imagine he’ll drift lower than his 5-2 morning line odds. He’ll be prominently featured in my play, but there are other runners at better prices that I want to focus on getting into the exotics. #4, LOOKIN AT LEE (8-1): Uncontested has run the fastest speed figures, but this Steve Asmussen trainee has kept the best company, having run well against champion Classic Empire in the Breeders’ Futurity before picking up the pieces to be fourth behind that foe in the Breeders’ Cup Juvenile. He’s been installed as the fourth choice on the morning line, but this colt is very much the other main player in this race. Like all deep closers, Lookin at Lee is reliant on the pace. If the fast pace that is predicted does indeed develop, it will greatly enhance his chances. Like many of Lookin at Lucky’s progeny, he improved with distance and racing as a 2-year-old, and that continued forward progression will give him a real shot to defeat the favorite here. I highly doubt he’ll go off at his 8-1 morning line, but you should bet him at that price if he does. #5, ROWDY THE WARRIOR (20-1): He picked up the pieces after Uncontested ran the others off their feet in the Smarty Jones, while earning career-best Beyer and TimeformUS Speed Figures. However, he still needs to run faster if he’s going to be a major player in this race and I’m more inclined to look at those with more upside. #6, CU RAHY (50-1): He’s never run a particularly fast race and was drowned by Uncontested in the Smarty Jones. Pass. #7, WARRIOR’S CLUB (12-1): I wonder if this horse would prefer to be fighting it out on the front end early in his races, because he seemed to lose interest when taken farther back off the pace in the Smarty Jones. I don’t want to be too hard on him for that poor effort over a sloppy track because he had previously run so well over dry going in the Kentucky Jockey Club, finishing ahead of Uncontested. Prior to that he easily defeated today’s rival Cool Arrow, also over a fast track. He feels like one of a few horses that could get ignored in the wagering, but he’s one of the main players in my view. #8, PETROV (5-1): This grey colt was assigned the difficult task of chasing down Uncontested last time. While he couldn’t stay with that runner around the far turn of the Smarty Jones, he nevertheless was game to hang on to second through the stretch while well clear of the rest of the field. He’s shown talent from the start of his career and has not put forth a bad effort in three starts. Given the amount of speed in this race, I wonder if Jose Ortiz will be instructed to take this son of Flatter farther off the pace, as they did two back at Aqueduct. Despite being so lightly raced, he’s shown great professionalism in his races and should be able to accommodate a change in tactics. On the other hand, I’m not totally convinced that he really wants to go much farther than a mile and stamina could become an issue. #9, DILETTANTE (15-1): Like most of D. Wayne Lukas’s young runners, this colt took a while to figure the game out. However, ever since he was finally stretched out in distance, things have started to click. He was a good second to Silver Dust three races back after waiting for room and coming through a tight hole along the rail. You can throw out his race two back when he got an impossibly wide trip. Then last time, he finally put it all together and broke out of the maiden ranks with a commanding win. He earned a lofty Beyer Speed Figure for that effort (the TimeformUS number was lower), but regardless of how fast he ran, he’s going to have to handle a significant step up in class today. He’s certainly bred to be a nice horse, by top sire Unbridled’s Song out of a full sister to Grade 1 winner Awesome Humor. I won’t be surprised if he’s competitive in stakes at some point, but I’m not sure he’s quite there yet. #10, HENCE (20-1): Here’s another Calumet Farm-owned runner, though this one is trained by Steve Asmussen. This Street Boss colt ran well to finish just over two lengths behind eventual Lecomte winner Guest Suit in his second start as a 2-year-old and followed that up with a game second-place finish in a salty maiden race in November. Hence’s last race is worth viewing because he ran much better than the three-quarter-length margin of victory would suggest. He took a clear lead coming off the far turn and looked poised to run on to a decisive victory before he ducked in sharply at the eighth pole. He completely lost his action after just barely avoiding a collision with the rail, and gave away all of his margin to the eventual runner-up. However, he quickly composed himself and battled back gamely to get the win. If he had kept a straight course, he obviously would have run a speed figure that was some 6 to 8 points higher, if not more. That kind of number would put him in the mix and his versatile running style should allow him to work out a decent trip. #11, ONE LINER (7-2): He was laid up for many months after his encouraging debut, in which he beat two horses that would come back to finish second and third in the Grade 1 Hopeful. His return to the races this past month at Gulfstream was encouraging. He earned a strong speed figure and finished well while being asked to gallop-out through the wire. However, an easy win as the odds-on favorite going six furlongs at Gulfstream is a completely separate task from making your graded stakes debut while stretching out to two turns. Can he overcome what is projected to be a fast pace while testing his stamina at this route distance? Todd Pletcher’s statistics with 3-year-olds stretching out for the first time in graded stakes on the dirt suggest that we should be optimistic. According to DRF Formulator, over the past five years Pletcher is 5 for 15 in this situation, yielding an ROI of $7.06. Now, that ROI is so large due to the presence of one gigantic price in the sample (Danza winning the Arkansas Derby), but 12 of those 15 have finished in the money, so his horses do typically run well. Despite those strong numbers, I still think this is a tough spot for this horse. #12, P C COWBOY (30-1): He’s never run fast enough and is now moving from a trainer who gets a 98 TimeformUS Trainer Rating into the barn of a conditioner who gets just a 49 Trainer Rating. #13, CHIEF KNOW IT ALL (12-1): I respect almost everything that Brad Cox sends out because his runners just routinely put in solid performances no matter the circumstances. However, this is a tough post position to overcome for a horse that would prefer to be forwardly placed. He beat a weak allowance field last time and is probably in over his head here. I think the proper wagering strategy in this race is to use the logical contenders – Uncontested (#3) and Lookin at Lee (#4) – with some larger prices in the exotics. The longshots that interest me most are Silver Dust (#2), Warrior’s Club (#7), and Hence (#10). I’ll focus on using them in exactas and trifectas.